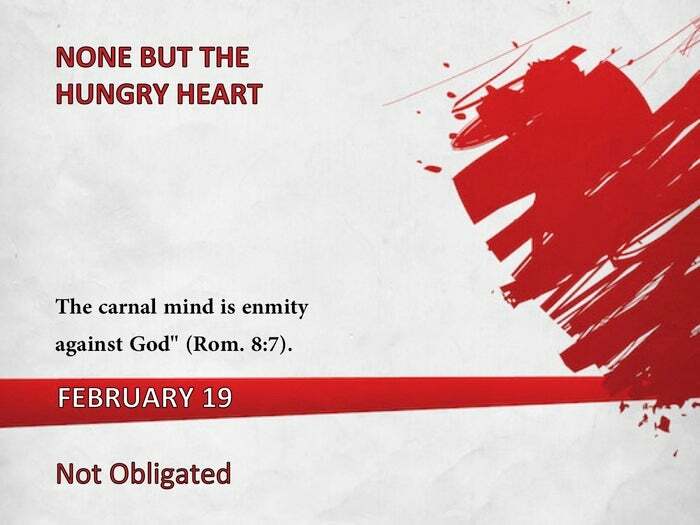 The carnal mind is enmity against God" (Rom. 8:7). Early in the Christian life we naturally feel that it is our obligation to overcome self and become spiritual. We do not yet realize that time and processing are required before we are able to give up self-effort for our growth. It is the work of the Holy Spirit, not our obligation. "God hath chosen you to salvation through sanctification of the Spirit" (2 Thess. 2:13). "The self-life is surely our first and most bitter foe, and the believer who will serve God acceptably must learn His way of victory over this subtle and dangerous enemy. The flesh is irrecoverably fallen and you and I make no real progress in the Christian life until we have learned in experience to say with the apostle: For I know that in me (that is, in my flesh dwelleth no good thing' (Rom. 7:18)." -J.C.M. "Paul's great endeavor, in all his great struggle of Romans Seven, was to make â€˜the flesh,' his old self-life, consent to do that holy law which his new self approved. Paul had not yet despaired of himself. The fact is, he had not yet realized the absolute distinction between the old and the new creations. And it was through this terrible experience that he found the new or inward' man to be distinct from the old man; that the realm of the spirit' was absolutely separate from that of the flesh', that all of the old self, with its life and energy, was to be despaired of, not sanctified." "For it is not subject to the law of God, neither indeed can be" (Rom. 8:7). Safe Beyond Question Neither give place to the devil" (Eph. 4:27).